From the time Sue moved into Earl’s Court Square, in 1992, she has devoted an endless amount of time and energy to furthering the public good without looking for self-interest or personal promotion. Her home soon became a hub for community activity. Sue has been a guiding light in the Earl’s Court Square Residents’ Association, taking on the editorship and production of its quarterly newsletter and its distribution to 700 households, raising the cost from local advertisers. She has been instrumental in the RA achieving Gold Standard, with time-consuming participation in all its events. She has also been instrumental in the successful establishment of and funding for Solidarity Sports, the charity which tackles the problems of disadvantaged youth throughout the borough. Without her participation and help the Earl’s Court Community Trust might never have got off the ground and the Earl’s Court Society has her amelioration skills to thank for its smooth establishment and running. Above all, Sue will be remembered for responding to countless individuals who need any kind of help or support, regardless of who they are, making the world a better place to live in. Sue Lupton is Community ! She lives it, she loves it : she makes it happen. During the last 10 years which I have known Sue, she has rolled up her sleeves and opened up her wallet to make so many local events possible. She is my go to gazebo woman, she is serves a mean cup of tea and uses her masterful marketing experience to promote all things good. Her especial passion over the last few years has been Solidarity Sports which is a tremendous charity for local children who have done such wonderful things for underprivilege kids in the borough. We have co-produced a French play together which is something I would love to do again with her soon. She has edited a local garden square newsletter forever. She's a great friend, who always has a smile on her face but also has a smile in her heart. Without Sue’s help and work behind the scenes, the Earl’s Court Community Trust, a charity founded to promote Arts and Culture, might never have got off the ground. As a past recipient of the Mayor's Award I would wholeheartedly recommend Sue to get one this year! I hope you can still include this in your application. Sue Lupton was been incredibly supportive of my career as a professional violinist playing with The Pomegranate Piano Trio. She has introduced me to a music agent, a mail out expert and a video maker. She has paid for two promotional videos for the trio and several consultations with the agent. I know she has given similar support to other musicians. 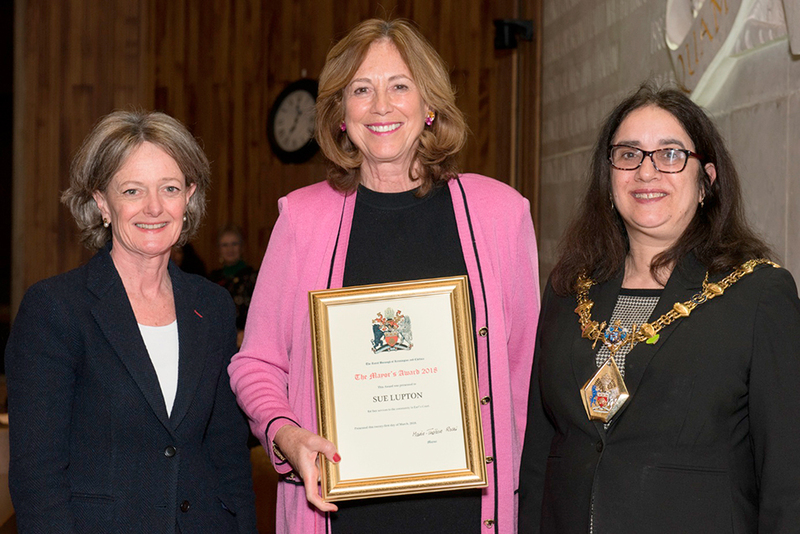 I am very pleased to fully support your recommendation that Sue Lupton should receive an RBKC Mayor’s Award. I know she has for long achieved a huge amount through her voluntary work for the Earls Court area and Community. She has also been a member of the Friends of Brompton Cemetery for some time, and on several occasions has given me good advice and help on specific issues. She is clearly committed to making a positive difference for the good of the local area. I fully support this recommendation. Suzie Lupton is one of the most beautiful and kindest women it is possible to meet. For more than ten years now, I have had the great fortune to work with Suzie in our community of Earl’s court, first on the Earl’s Court festival where Suzie brought her unparalleled energy and work rate, plus her formidable professionalism, being a founder force in putting on many world class events. Since that time, Suzie has stood out in Earl’s court as a behind the scenes power house always volunteering to be a central organiser when community work is required. Suzie takes responsibility with grace and assurance so to put all who work with Suzie at ease. Suzie’s simple but profound philosophy, to always see the positive side in life and in people, makes Suzie glow with vitality. I have seen Suzie give her heart and soul to help numerous individual people especially at times of misfortune or illness. It is a great honour to know Suzie. It is an even greater honour to be a friend of Suzie Lupton. It is with great pleasure that I recommend Suzie Lupton for this award. Sue Lupton has the extraordinary gift of being the backbone of many things without needing to be applauded and accoladed. Sue is the person who comes up with ideas, puts them into effect, makes sure all the details come together, adds a huge amount of style and sparkle and then keeps an eye on things from the wings and smiles as the organisation or group she is supporting gets the credit. Sue is like an octopus - a huge amount of brain; tentacles that reach into every address book imaginable and allow her to do several things at once; the ability to camouflage herself into the background; and also they power to fascinate and marvel at by her ability and ingenuity. Sue is an active part of the Earl’s Court Community - involving herself in the Residents Association, the production of the newsletter, providing elegant and civilised parties at community events such as the Square’s barbecue showing how it can be done, events in the garden. She is also a supporter of Solidarity Sports organising events and was a great proponent of the community bank programme. Sue is the person who chooses the organisations she supports and then supports them practically. She is a marvellous hostess, kind, considerate and generous with her time, her skills and her vast experience, but also and perhaps most importantly with a warmth and sense of humour that is only exceeded by her extraordinary patience! We first met Sue 7 years ago. 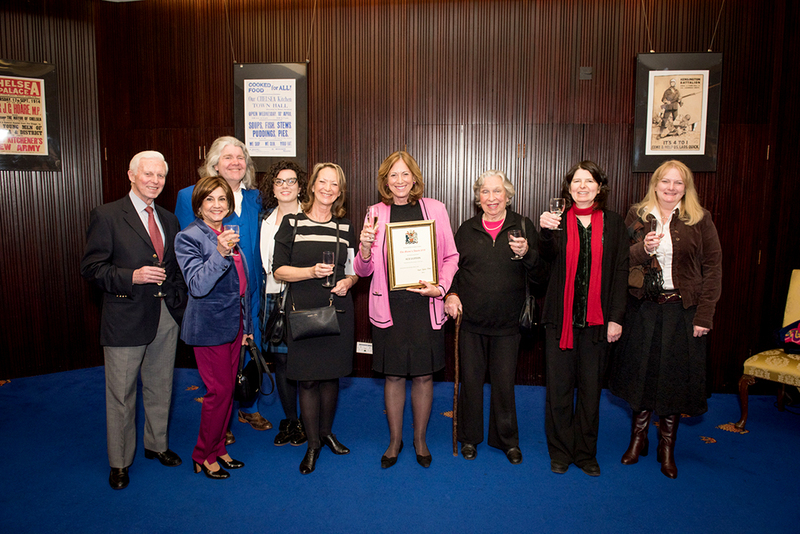 Since then, Sue has dedicated a remarkable amount of time and effort in helping raise significant funds to support our work with the most vulnerable children in RBKC. From helping us raise over £8000 at our fundraising concert, to personally visiting families and helping with basic needs, such as food and bedding, Sue has been truly generous and we are so grateful to be able to count on her support. Sue has also been a source of great comfort to myself, offering advice and guidance during our most difficult times, such as when three of our children and their parents died at the Grenfell FIre. Without Sue, we would not have been able to change the lives of so many children and helped them to heal from the trauma they have suffered. Sue is a unsung hero and I strongly believe that she deserves to be recognised for all the good she has done for disadvantaged people over the years. Sue really cares for her community and there are many instances of her caring for old and young alike from organising a table at our BBQ/Disco (which anyone is welcome to join so they are not excluded) to being a cheer leader for all the children who come to ECSRA’s annual “Lighting of the Tree” with carols and a chocolate-laden tree. To summarise, Sue’s enthusiasm and love for her community is a shining example to us all.